The MBTA (the “T”, commuter rail, city bus system) is the best way to get around Boston, not only because it is sustainable to utilize public transportation, but also because parking is scarce aswell as expensive. Take advantage of tools such as the MBTA Rider Tools or mobile apps to better navigate Boston's transportation system. CharlieCards are plastic cards that you can add value to via cash or credit card. If you are a student or employee that is getting a discounted pass through the school's bursar's office, you will likely receive a CharlieCard. You can find more information about discounts available to students and employees here. View campus-specific public transportation instructions below. 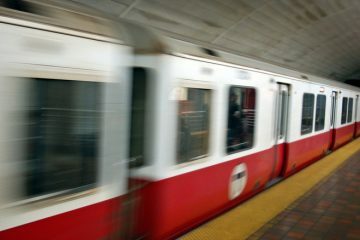 Take the Red Line to Davis Square. Tufts Medford Campus is a quick 15-minute walk. Take the Fitchburg Line to Porter Square. For all other lines, go to North or South Station. 11% discount for students, 35% for employees: find more information here. Take the Orange line to Tufts Medical Center Station. Other nearby MBTA stops are Downtown Crossing (Red/Orange Line) and Boylston (all Green Line routes). Take the Commuter rail to Back Bay or South Station. Tufts Boston Campus is about a 12-minute walk from South Station or a 20-minute walk from Back Bay. 35% discount for students and employees: find more information here. The Grafton campus is less than a 10-minute walk from the Grafton Station on the MBTA Framingham/Worcester Commuter Rail Line, which runs between South Station in downtown Boston and Worcester. From the Grafton Commuter Rail Station, exit the parking lot and take a right onto Pine Street and a left onto Route 30 (Westboro Road). The Cummings School is just up the road. The Worcester Regional Transit Authority (WRTA) bus system's Bus Route B has a stop at the Grafton commuter rail station. The bus makes stop at Stop&Shop, Shaw's, Ocean State Job Lot, Walmart, Cumberland Farms, and Grafton Town Common. The full bus schedule is available at therta.com. You can track individual busses here. Bicycles can be carried on to MBTA Commuter Rail trains on weekdays, expect during peak periods, and on the weekends. There are bike racks located on the WRTA buses that service the Grafton campus. Take the Green Line (E line) to Museum of Fine Arts Station (MFA Station). Take the Commuter Rail to Ruggles Station or Yawkey Station. The SMFA campus is about an 11 minute walk from Ruggles or a 15 minute walk from Yawkey.